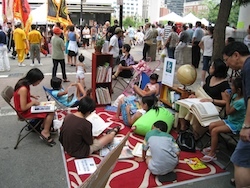 On August 16, the Storefront Library Project was at the 2009 August Moon Festival. Staff were on-hand to talk about the project, and elements of the Storefront Library program were demonstrated, including a children’s reading area, photography, art and calligraphy books for adults, and free WIFI. A slideshow of the event is available in the Multimedia Player, at right. Thanks to Jen Wang for volunteering as a translator/reader and Laura Jean for outreach work during the event.